Building distributed systems is hard. Pesky things like the laws of physics get in the way of maintaining state accross geographically (and chronologically) disparate systems, and, if that weren’t already outrageous enough in itself, those systems may be subject to network failures, forcing us to think about annoying tradeoffs regarding consistency, availability and the meaning of life. One of the more interesting (well, at least from my perspective) tools in the Akka toolbox is Akka Cluster and the modules built on top of it. Through its design it acknowledges the hard reality of life, promoting a “no magic here” approach to building distributed applications and yet at the same time, takes care about many of the harder aspects of doing so. In this article series, we will explore different components of Akka Cluster, taking the use case of a (simplified) payment processing system. This first article is focusing on the Akka Distributed Data module. As of version 2.5, it is no longer experimental and gets better with every release. This module makes use of Conflict Free Replicated Data Types (CRDTs, in short). While there generally is a consensus that this name conveys a tremendous degree of coolness and while people get quite excited and all agree of how useful and promising those data types are when they come up in a conversation, it has been my experience that once the conversation shifts to the topic of, er, actually using those neat things in practice, silence ensues. As a supporting use case for exploring Akka Cluster, we will build a reactive payment processor. The job of this system is to allow its clients (merchant systems) to accept payment orders (such as credit card payments for example) and to take care of all the intricacies related to processing the order so that money flows from one account to another. This isn’t done by the system itself – instead, the system places an order with an acquiring bank which takes care of executing the financial transaction. Note that we are going to simplify things quite a bit along the way. That being said, we’ll keep the crucial aspects of such a system in place so as to be able to talk about tradeoffs and to explore various solutions and tools. In this first article, we will operate under an important assumption, which is that the communication with acquiring banking systems is more often than not limited to one physical machine. This may be because the acquiring bank only allows the connection from one machine at the time or because of special security mechanisms (based on hardware tokens for example). When an order first hits the system, it gets marked as New. It then undergoes validation and configuration and as a result will be enriched with more information required for its execution. Failing this, the order is marked as Rejected. Validated orders get forwarded to the acquiring bank for execution which either results in a successful Executed status or an unsuccessful Failed status. Finally, when an answer has been sent to the client, the order is marked as Done. The source code for the application can be found here. Akka Distributed Data is a module designed to allow sharing data between cluster nodes. It is designed as a key-value store, where the values are Conflict Free Replicated Data Types (CRDTs). This allows for the data to be updated from any node without coordination due to the nature of CRDTs – the values always converge. In order to further interact with the replicator, we also need an implicit Cluster to be in scope, since the module expects to replicate data using it. 5) A function to execute in order to modify the value of the data. In our case, we aim at adding a new StoredOrder to the map, which is exactly what we do here. Note that we use String as the type of the key, which is why we need to serialize it explicitly. What happens when sending an Update message with our Key is that the value of that key in the local distributed data store, which is to say the entire ORMap, will be passed to the modify function that we have implemented. Or to put it differently, in the example above we are working with a “map of maps” (the outer map being the Distributed Data Key-Value store, and the inner map being our ORMap of orders). – something in between, because, hey, distributed systems! When everything goes according to plan, we get back an UpdateSuccess message that we can match against – specifically, using the Key of our data as well as the request type we used originally. Next, in the category of “certain failure” we have a ModifyFailure. This is a wrapper for any kind of exception thrown while executing our modify function. This is a good indication of a programming error – this really shouldn’t fail. an UpdateTimeout happens if we didn’t get a positive acknowledgment from all the nodes at the write consistency level we expect within the timeout we configured. In our case this would mean that the majority of the cluster nodes didn’t reply within 5 seconds. This doesn’t mean that they won’t answer eventually. It may as well mean that the nodes were slow for one reason or another, or that there was a network issue. Deciding what to do if this happens really depends on the use-case and on the type of guarantees you want. a StoreFailure happens if there was a problem writing to durable storage locally. Durable storage is a form of local, disk-level persistance that can be activated for specific distributed data keys as an additional protection against data loss in case of node crash. There is more you can do with the replicator, such as retrieving data for a key or deleting data, but we won’t cover this here. Let’s rather look at the type of data itself. So far, we talked at length about ways of interacting with the distributed data key-value store, but we haven’t adressed the elephant in the room, which is to say that the data needs to be of a specific type for all of this to work. * replicated data type (CvRDT). * The type of the concrete implementation, e.g. `GSet[A]`. * To be specified by subclass. In other words, the typed key is how the replicator knows how to deal with values of a certain kind. Akka Distributed Data provides a set of basic CvRDTs to work with. In our example, we use an observed-remove map which in case of concurrent updates (i.e. a merge with multiple possible values) will keep a key over removing it. As we will see later on, in our case, this is a limitation we can work with. A nice property of CvRDTs is that they can be combined to create more advanced data types. Take for example the PNCounter which is a counter that can be incremented and decremented – something that clearly isn’t monotonic. Internally it works simply by having two GCounter-s (grow only counter), one used for increments and one for decrements, the value of the counter being the increments minus the decrements. Other types of CRDTs rely on external input to complete the merge. For example, the CRDTs of type last-write-wins (LWWMap, LWWRegister) use clock time to figure out how to merge concurrent changes. Whilst this can be quite useful it also means that you need to have synchronized clocks accross all nodes, which can be tricky to achieve in practice (to put it mildly). The type of CRDT to use depends heavily on the use-case at hand as well as on the setup. In what follows, we will see how to create custom data types and how to combine them with existing CvRDTs. Let’s come back to our reactive payment processor. We want it to be as robust as possible, not depending on the failure of a single node. At the same time, we also acknowledge one important design consideration, which is that the connection to an acquiring bank is limited to one node at the time (worry not, we will come back to this point in a further article). What we’ll do is that – as you may have guessed by now – replicate the incoming orders using Akka Distributed Data. For this purpose, we will need to create a custom distributed data type that represents the orders and then integrate akka distributed data with the rest of our system. (MerchantAccount, CreditCardToken and Currency are AnyVal-s wrapping primitive types, for type safety). As we saw earlier we need to specify the type T of the data, which is simply the StoredOrder itself. The more interesting part will be the merge function – how do we define this function so that concurrent changes always converge to one unique version? Let’s reason about our data for a bit. The order identifier is a value that we will generate very early in the lifecycle of the order processing, possibly signalling it back to the client. We know that the identifier will not change throughout the lifetime of an order, therefore merging two orders with the same identifier will retain the same identifier. The initial Order itself is likewise not going to change – we will not want to change anything regarding the amount, currency or affected merchant on the way through our system. Being perfectly immutable, any representation of the order will do. The bankIdentifier is a piece of information that we only get to know about once the order has successfuly passed the validation stage. Before that, it is undefined. If we merge two orders, one of them having a bank identifier set and one having it be undefined, we will retain the version with the most information, i.e. we will keep the populated bankIdentifier Option. Note that in this example, we will suppose that the validation mechanism in all nodes will always yield the same identifier and not produce conflicting results. If that were the case, we would need to use a more elaborate mechanism to be able to tell which confiugration result “wins” by for example using version numbers for this type of configuration data. Simple, isn’t it? Let’s look at the more advanced bit – the order status. in the case of Executed versus Failed the decision is rather easy to take – if the order was executed on one node, i.e. it has executed at least once, we will retain the status as Executed. in the case of Validated versus Rejected we have to consider what this means in relation to our system implemntation. If we trust that the validation is conservative, then if one node yields a Validated status, then it means that we can trust this richer result. It is likely to say, for example, that the validation failed on the other node because a third-party component required to perform the validation (such as a database, for example) was not available on that node. We will therefore favour Validated over Failed. All that is left to do after handling these two exceptions is to implement a merge function for an acyclic directed graph that searches for common descendants. This is the point at which you will want to get a copy of Reactive Design Patterns by Roland Kuhn with Brian Hanafee and Jamie Allen which defines such an algorithm (for a more optimistic case in which the conflicts we have can’t arise). Rather than rolling our own here, we therefore reuse Roland’s algorithm for the non-conflicting cases. You can check the implementation in the source code for this article. With this design, from the perspective of the other actors in our system, it doesn’t matter how the OrderStorage is implemented – whether we were using Akka Distributed Data or another type of storage should not have any specific impact of them. Let’s discuss those for a bit. When defining our custom data types, it is important to also take care of the serialization aspect – by default, Java serialization will be active, and this is hardly performant at all. Serialization for custom data types is implemented using protocol buffers as described in the Akka Documentation. 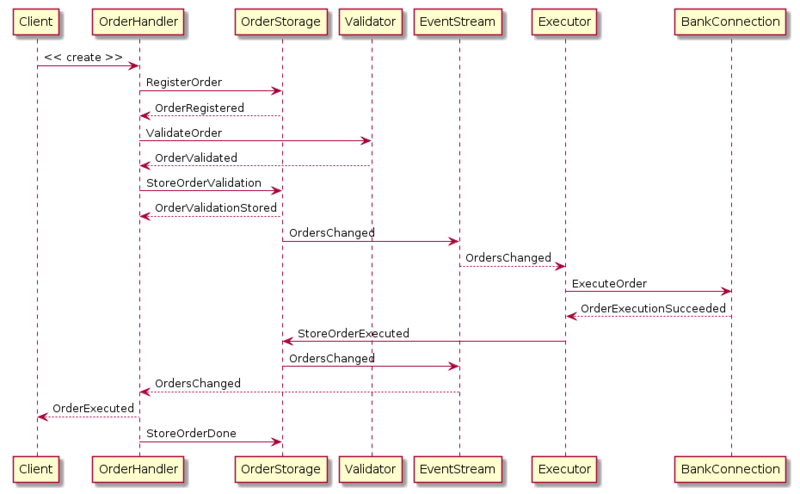 In our example, the Order class is rather simple but could potentially be more complex in reality. As we saw previously, only a small part of the StoredOrder will be subject to change, the rest of the data being immutable. Rather than having to replicate the entirety of the data type every time, it would be much better to only synchronize those bits that have indeed be subjected to a change. This can be achived by implementing the DeltaReplicatedData type rather than the RepicatedData type. Once an order has been processed, there is little value for it to still be kept around in our orders ORMap. In principle, this just means removing the key from the map in the modify function. In practice, since we do use an observed-remove map, it means that in the case of a conflicting change (one node removes the order, while another one adds / updates it), the add operation will win. Therefore we need to make sure to additionally prune non-removed Done entries from time to time, should such a concurrent update take place. In this article we have introduced the example of a reactive payment processor and looked at how to use Akka Distributed Data in order to achieve master-to-master replication. We have implemented our own ReplicatedData types and used them in combination with one of the existing distributed data types provided by Akka. we don’t store anything in a durable storage, which would be quite crazy in real life! In the next articles of this series, we will check if our design can be evolved to withstand failure in the face of node outage. Stay tuned!